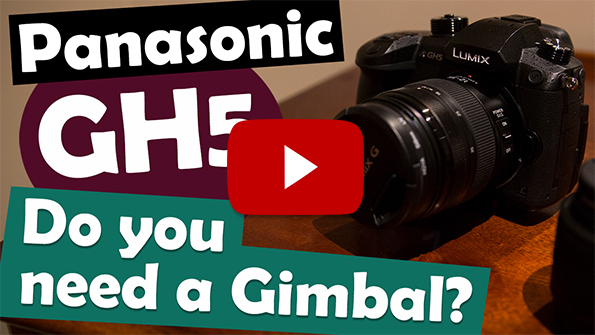 ::: Learn Like Me™ ::: Do I need a Gimbal Stabilizer with the Panasonic GH5 IBIS or Dual IS? Please note that this article is based on my own experience and opinion on using the equipment mentioned and as such, other users using the same equipment may have varying results or opinions. One of the main reasons why I purchased the Panasonic GH5 Mirrorless camera was because I wanted to record stabilized footage without the need for a Gimbal Stabilizer. There was a lot of hype surrounding the GH5 before it was released ranging from it’s video capabilities, packed features, auto-focus to its image stabilization, which were some of the reasons why I purchased it. Not all the hype was accurate though especially when it came to auto-focus. Initially I was bothered by this but after several uses, I realized it was not a feature to be overly concerned about as I was able to adapt to regularly using manual focus for this camera when shooting video. It was the image stabilization that was my main concern. I was under the impression that I could ditch my handheld gimbal stabilizer so that I could be more travel and solo shooter friendly but after shooting several videos, I realized that, even though the IBIS and Dual IS of the Panasonic GH5 performed well in stabilizing various shots, it’s results was not enough to render a gimbal useless. After some time using the equipment and making the following test footage, I was able to form the following opinions. Using Dual IS where both the camera’s in body image stabilization(IBIS) and lens image stabilization(IS) work in sync, produced the best results between the two systems. In general, both systems produced the smoothest results from movements at a stationary position(standing still and using your body or arms to create the movement). Both systems exhibited obvious footstep movements once you use it while walking or running but Dual IS produced a smoother controlled result. IBIS on it’s own is useful especially in photography instances where you are using a slow shutter speed and need to minimize camera shake but it will not freeze moving subjects though. Having IBIS allows you some flexibility in the lens you choose as it will provide some form of stabilization on any lens that does not have inbuilt image stabilization. These stabilizing systems can help significantly when applying software stabilization in post production such as Warp Stabilizer in Adobe Premiere Pro. Adding a gimbal to these two systems is where you will gain the most benefits. The footage becomes smoother, minimizing those unwanted jerkiness that can be seen when walking or running with the camera. Using the Gimbal Stabilizer with IBIS or Dual IS is not perfect though. It still produces some form of jitters or shakes depending on the style of shooting made and what focal length you are shooting at. The wider the FOV or lower focal length helps minimize the perceptive effects of any shakes or jitters (ie. 24mm) but the higher the focal length (ie. 50mm) is where your stabilizer is put to the test. You can examine the corners of your footage at full resolution to see how much your footage is actually shaking. Even using a gimbal on it’s own with a camera without image stabilization can produce very good results that requires less software stabilization in post, which helps make the stabilized footage more convincing. When should I use IBIS? If your lens does not have image stabilization, then the GH5 IBIS will provide the image stabilization when you are shooting. Using good form and technique when moving, can help you achieve the best results in your footage. You can then stabilize it further in post production. When should I use Dual IS? If your lens has the capability such as the Panasonic Lumix 12-35mm f2.8 II lens. The results are better than IBIS in most situations with less degree of jerkiness. Dual IS works very well especially in keeping a long stationary shot steady in Photography. The Lumix 100-300mm f4-5.6 zoom lens is a good example of how effective Dual IS can be. At that range, the jerkiness was apparent when shooting handheld video but for photography, it’s invaluable. When should I use a Gimbal Stabilizer? If convenience, portability and weight is not an issue, then you should use a gimbal as often as possible. Creating long or complex handheld movements that involves footsteps are difficult to keep steady and smooth but it is more achievable with the use of a gimbal. Is it worth getting a Gimbal for the Panasonic GH5 Mirrorless Camera? In my opinion, yes. You would still be able to produce acceptable stabilized footage using IBIS or Dual IS but it would be lacking smoothness in some situations. For example, I found that if you are using handheld and you are stationary, and the movement is coming from the platform you are on, or from your arms, then IBIS or Dual IS works well. Eg. Handholding the camera on a moving bike where your arms can absorb the vibrations, or using your arms to create movement while using your legs or body as a solid pivot platform. As shown in the test footage, IBIS and Dual IS does not work as well if you are using your feet to move. I think if you are serious about your footage being very stable and smooth, it’s imperative that you use a gimbal along with whatever image stabilization is available to you from the camera body or the lens. The gimbal itself on a camera setup without image stabilization will still produce good results but from my experience, the addition of IBIS or Dual IS provided smoother results that was easier to apply further software stabilization in post with. and the resolution you use or view the footage with. There is also the possibility that different stabilizing systems from the camera or lens may not work well together with the gimbal so prior testing may be necessary to identify any incompatibilities or issues. For travel and portability, I think IBIS or Dual IS combined with a monopod, or tripod, using good form and technique, and some post software stabilization would be adequate in achieving acceptable stabilization in various situations. The only drawback may be in regard to productivity, as these steps may add to the amount of time needed to create the desired smoother footage.